With CTIA 2012 in the rear-view mirror TechRadar bids a fond farewell to New Orleans. While we were disappointed that some of the major cell phone manufacturers and carriers opted out, we were really pleased to see some awesome handsets like the Droid Incredible 4G LTE and online editor Nic Vargus won't stop talking about how awesome his brand new HTC Evo 4G LTE is (look for his full review of the device in the next couple of days). While shows like CES (Consumer Electronics Show) and MWC (Mobile World Conference) also highlight what's up and coming in the world of mobile technology, CTIA Wireless has a decidedly U.S.-focus. An all new mobile OS? We were pleased to get some hands on time with a device running Boot to Gecko, Mozilla's web-based mobile platform and Unnecto impressed us with their Android-based dual-sim Quattro. While many in the States have yet to hear about ZTE, the Asian manufacturer is making a major push to move into the US market. At CTIA 2012, the company made several significant announcements, including new partnership deals and a company executive even singing the praises of the Windows Mobile platform. Amazon beware, is the new Nook a Kindle killer? In addition to phones and tablets, Barnes & Noble was present at CTIA 2012 showing off what they hope could be a Kindle Killer: Nook Simple Touch with GlowLight. Verizon fired the first major shots of CTIA 2012 by giving us a hands on demonstration of this...incredible... handset. The LTE capable phone will come with a 1.2GHz dual-core processor, a 4-inch qHD Super LCD display, a 960x540 resolution, 1GB of RAM, 8GB of storage, an 8MP camera, Ice Cream Sandwich and HTC Sense 4.0. Not to be outdone, HTC had a huge presence at CTIA 2012. While their enormous booth on the show floor highlighted such non-technology-related acts like modern dancers and a guy doing tricks with bubbles, the good folks at HTC gave TechRadar a long and extensive hands on demo of their awesome new HTC Evo 4G LTE. Fresh off the heals of the wildly successful launch of the Samsung Galaxy S3, Samsung was on hand giving folks in the U.S. their first look at this promising new device. Of course, since our brothers across the pond back in the U.K. already did a hands on review of the Samsung Galaxy S3 last week, those of us here in New Orleans could focus on the company's other offerings. The Samsung handset that we were most excited to see was the Samsung Focus S2. With nearly all of the bells and whistles as the Nokia Lumia 900. The Samsung Focus S2 is nearly half the price. While we expected to see handsets from all of the major manufacturers, there have been some rather conspicuous omissions: Sony, BlackBerry and Motorola informed TechRadar before the start of CTIA 2012 that they will not have a presence at the show. While that proved to be true for Sony, Motorola it seems was content to let their partners show off their latest devices. Like the Droid Incredible 4G LTE. We had hoped to get a hands on look at the upcoming BlackBerry 10. When TechRadar spotted a BlackBerry rep they informed us that they didn't have any devices here in New Orleans, but rather that the devices are currently in the hands of app developers. Oh well, hope it does seem, springs eternal. Additionally, Sprint also informed TechRadar that they too wil not have a presence on the show floor. While the major handset manufacturers garner the lion's share of the show's attention, CTIA 2012 is awash with accessories for each and every mobile device you can think of. Of course, while Apple never attends CTIA, that doesn't mean that the company's overwhelming dominance in the mobile space (especially with its iPad) goes ignored. Aftermarket companies are everywhere here at CTIA 2012 showing off everything from cases for your mobile devices, to headsets and mobile speaker systems. 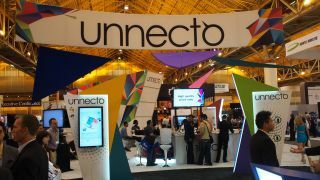 TechRadar is in New Orleans throughout the week of May 8 to bring you updated news, hands-on reviews and more. So check back to enjoy all of the shiny new goodness that is CTIA 2012.